Usurp Art Residency 2009 – Canons High School Harrow Middlesex. Students at the school wanted to explore the idea of peace and how they could create something that would become a sculptural piece that could be added to over time. Usurp were approached to facilitate this. 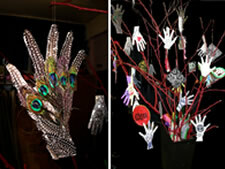 A Peace Wish Tree was created and exhibited at a local festival where people created their own contributions and a series of discussions took place within the school..